Today was the big Council meeting to discuss the proposed Vehicle for Hire Bylaw. Last week the City informed the media they’d need to pickup a press badge in order to be present today, and security was increased at City Hall in anticipation of heated protests. But despite a few minor outbursts during the meeting, it all felt a little underwhelming. Many Councillors used the opportunity to get on their respective soapboxes to complain about whatever – some ripped into Uber, some expressed anger at Administration, and one or two questioned why we regulate taxis at all. But that was the only drama, because in the end Council asked for more information and deferred a decision on the bylaw until late January. Make no mistake, Uber is going to walk away from this whole situation happy. Why? Because there’s a lot more Edmontonians that want to see Uber here as an option than there are Edmontonians willing to speak up for the taxis. Council is hearing loud and clear from constituents that they want Uber in Edmonton, and that’s the most effective way to get Council to budge on something. And even if the rules that do eventually get passed aren’t ideal for Uber, they may be good enough as Councillor Walters points out. They’re threatening to leave now because it helps them secure a better negotiating position. But once there are rules to play by, it’s a simple business decision – can they make money following those rules or not? 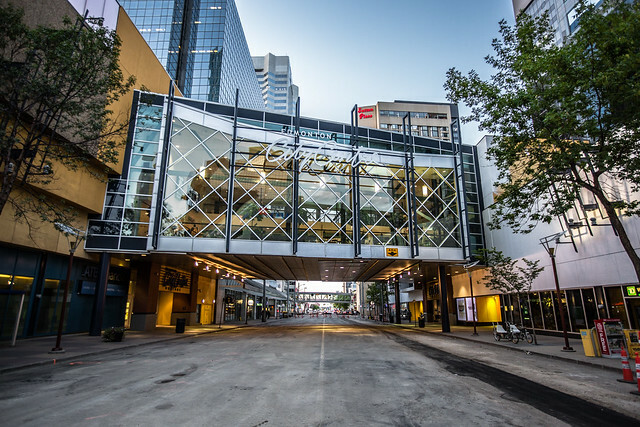 Today via Ted Bauer I saw that Oxford Property Group is planning to invest $41.3 million to “revitalize the entire retail experience” of Edmonton City Centre. A big part of the plan is to “relocate and significantly upgrade” the food courts. Currently located on the lowest level of the mall, one on the west and one on the east, the existing food courts will be consolidated centrally on the top level (as is now common in other malls and shopping centres). The news release mentions that “over 23,000 new residents are expected to be living downtown by 2019.” It’s great to see that Edmonton City Centre is looking at this as an opportunity and that they’re willing to invest in order to compete with Ice District. There are already a lot of empty spaces in the mall, including many that have been empty for months or even years. With a new hotel, new theatre, and lots of other retail moving just a block or two away into new buildings in Ice District, it was starting to look like Edmonton City Centre would be even emptier in just a few years. That’s a bit of a stretch! Still, good to see them willing to make a play for a piece of the pie. We’re in the middle of budget season, as you are probably aware. On Monday, November 23 a non-statutory public hearing will be held at City Hall from 1:30pm to 9:30pm. It’s an opportunity for you to speak directly to City Council about the proposed budget before a decision is made in early December. If you’d like to register to speak, you can do so here. The full budget is available at edmonton.ca/budget2016. If you’d like a friendly introduction and overview to the budget, check out yegcitybudget.ca. And finally, if you’re a geek like me and want to dig into the data, budget.edmonton.ca is the best place to start. The final budget discussions get underway starting November 27.